Every day the room was clean when we returned from classes.. Beds were comfortable. But rooms definitely need to be updated & CLEANED! the breakfast in the morning was halfway decent, walking to it was rough though... no easy access. Enough to fill up on. The bedroom seemed fairly clean. Having tv was nice, but the tv itself wasn’t very good quality. Room was poorly cleaned, we had to clean the surfaces ourselves. The rooms were clean and nice. The staff were friendly. The breakfast bar was well stocked and fresh. Enjoyed my short stay with BW. I will use this place again in the future and recomend to others who travel this way. A perfectly adequate motel on Highway 18. Exterior screams 70’s. 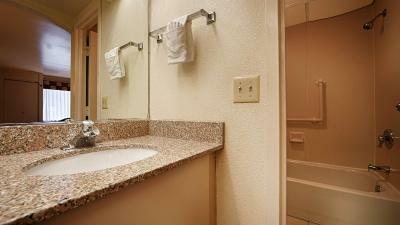 Interior is clean and standard in decor and amenities. Beds are comfortable. There was a mall across the street. Discount at close by restaurant. 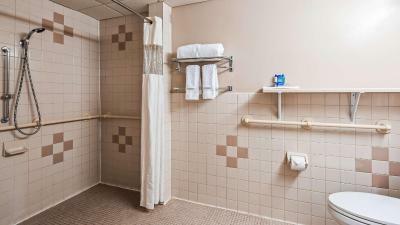 Best Western East Brunswick Inn This rating is a reflection of how the property compares to the industry standard when it comes to price, facilities and services available. It's based on a self-evaluation by the property. Use this rating to help choose your stay! This East Brunswick hotel is located across the street from the Brunswick Square Mall. 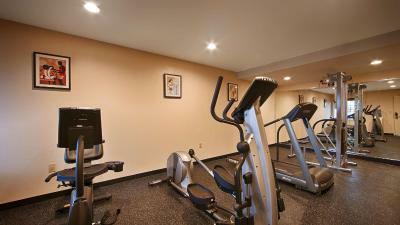 The hotel offers a gym and deluxe continental breakfast. All rooms have a microwave and refrigerator. 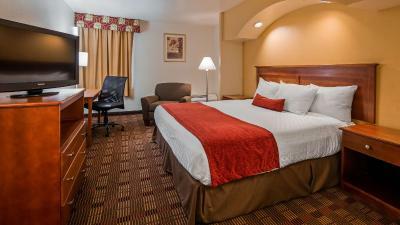 Best Western Inn offers a coffee maker, work desk and ironing facilities in every room. 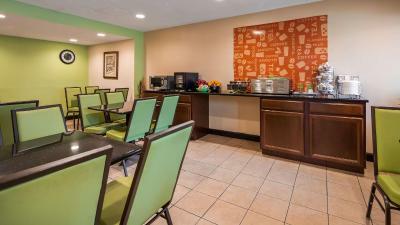 Cable TV with HBO and free Wi-Fi are also included and select rooms have a seating area. Best Western East Brunswick Inn provides a public computer with fax/copy services in the lobby. The front desk is open 24 hours and parking is available on site free of charge. 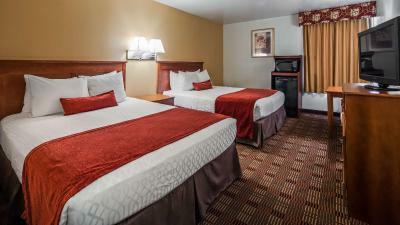 Rutgers University and Raceway Park horse track are a 15-minute drive from this East Brunswick Best Western Inn. The Garden State Convention Center is within a 30-minute drive of this hotel. 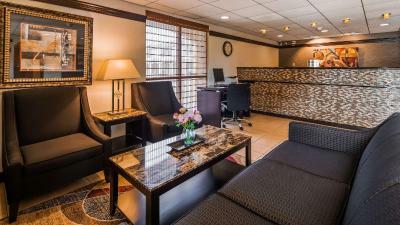 When would you like to stay at Best Western East Brunswick Inn? House Rules Best Western East Brunswick Inn takes special requests – add in the next step! Best Western East Brunswick Inn accepts these cards and reserves the right to temporarily hold an amount prior to arrival. Nothing. Great value and fit exactly what we needed! no elevator. people smoke too close to entrance. main entrance door not lock. Smelled of smoke! The rooms are supposed to be non-smoking but the hallway reeked of smoked so you could definitely smell smoke in our room. The air conditioner barely worked so it was hot. And the vent on the air conditioner hadn’t been cleaned in a LONG time!! It was soo dusty!!! Your beds and the pillows were extremely uncomfortable. Some of the tile work in the bathroom was coming undone/falling apart. A recycling bin in the bathroom, but no trash can in the bathroom, made no sense. Not the hotels fault but our room was next to the breezeway to stairs to upper level and when guests would come in at night the door slams shaking the entire room and kept waking me up. Maybe a sign that reminds other guest to be mindful and dont let the door slam. Location to the venue we attended. Guests were loud and smoked weed next door. We were moved into a different room, but noise level was still high. Mattress very uncomfortable. Sheets were dirty like they were washed with blue jeans ugh. Cons: One lamp light worked in the room out of four (that’s including the ceiling light which did not work). We had to turn on the bathroom light to be able to see. The front desk check in was an absolutely horrible experience. We had to wait thirty minutes to get our room, and we still weren’t checked in properly and had to repeat the process. Same thing happened to the family before me, so I can tell this happens with everyone who comes in. Pros: Rooms were clean and beds were comfortable for the price. The small refrigerator and microwave were a nice touch. Definitely a great price for a quick stay in the area. The hallway was quiet and I didn’t see or hear anyone while I was there.